MOP SINKS Dimension Price Wt. 21” x 25” $1315 26 lbs. 25” x 33” 1703 35 lbs. 21” x 25” 1578 45 lbs. 25” x 33” 1862 63 lbs. 29” x 29” 2334 70 lbs. 18 1/2” x 25” 2488 45 lbs. 9-OP-20 Shown  F loor Mo 9-OP-20 9-OP-28 9-OP-40 9-OP-48 LARGE MOP SINK BOWL 9-OP-44 24” x 24” x 12” DROP-FRONT MOP SINKS 9-OP-40DF 16” x 20” x 12” 9-OP-48DF 20” x 28” x 12” p Sin 16” x 20” x 6” 20” x 28” x 6” 16” x 20” x 12” 20” x 28” x 12” 9-OP-40DF Shown ks FLOOR uNiTS Mounting Hardware Included Overall Approx. Approx. Cu. 5 5 7 9 9 7 9 Model # Bowl Size STANDARD MOP SINKS = Ships Via UPS             22 1/2” x 33” 2769 63 lbs. Flush-Mount Floor Mop Sink Notched Out Front Allows Ease of Emptying Mop Bucket    • Easy Mop Bucket Roll-In Design • Standard Backsplash with Left & Right Splash, Left Splash or Right Splash Available • 4” O.D. - 3” Long Plumbing Sleeve • Front Anti-Splash Guard • Removable Subway Grating • Stainless Steel Strainer Basket with Handle FT-2 $55ea. Replacement Stainless Steel Strainer Basket with Handle for Flush- Mount Floor Mop Sinks      WITH STAINLESS STEEL GRATES Model # 9-OP-24FM-SSRL 9-OP-24FM-SSL 9-OP-24FM-SSR Approx. Wt. 128 lbs. 120 lbs. 120 lbs. Price $4201 4058 4058 9-OP-24FM-FGRL 9-OP-24FM-FGL 9-OP-24FM-FGR 96 lbs. $4201 88 lbs. 4058 88 lbs. 4058 Bowl Size 21 3/8” x 22 x 10” 21 3/8” x 22 x 10” 21 3/8” x 22 x 10” Overall Dimension 21 3/8” x 24” 21 3/8” x 24” 21 3/8” x 24” 9-OP-24FM-SSRL Shown Splash Approx. Locations Cu. Back, Left & Right 14 Back & Left 14 Back & Right 14 WITH FIBERGLASS GRATES   Approx. Model # Wt. 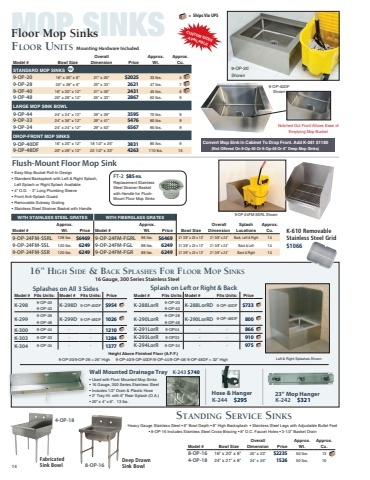 Price         You Can Use a K-610 Removable Stainless Steel Sink Grid In A Floor Mop Sink - $672    16” high SidE & BACk SpLAShES FOR FLOOR mOp SiNkS 16 Gauge, 300 Series Stainless Steel  Model # K-298 K-299 K-300 Fits Units: 9-OP-20 9-OP-40 9-OP-28 9-OP-48 9-OP-44 Height Above Finished Floor (A.F.F.) Price 26” $896 32” 26” 982 32” 32” 1162 Model # K-288LorR K-290LorR K-291LorR Fits Units: 9-OP-20 9-OP-40 9-OP-28 9-OP-48 9-OP-44 Height Above Finished Floor (A.F.F.) Price 26” $569 32” 26” 602 32” 32” 826 Left & Right Splashes Shown Splashes on All 3 Sides Splash on Left or Right & Back                     STANdiNg SERviCE SiNkS Heavy Gauge Stainless Steel • 8" Bowl Depth • 8” High Backsplash • Stainless Steel Legs with Adjustable Bullet Feet • 8-OP-16 Includes Stainless Steel Cross-Bracing • 8” O.C. Faucet Holes • 3-1/2” Basket Drain   4-OP-18 Fabricated Sink Bowl 8-OP-16 Deep Drawn Sink Bowl Model # 8-OP-16 4-OP-18 Bowl Size 16” x 20” x 8” 24” x 21” x 8” Overall Dimension 25” x 23” 24” x 25” Price $1451 990 Approx. Approx. Wt. Cu. 50 lbs. 13 50 lbs. 10   14 CUSTOM SIZES AVAILABLE DID YOU KNOW?